The Global Digital Health Forum—an annual meeting of health-focused government stakeholders, technologists, researchers, and donors from across the globe—is coming up December 10 through 11. Trevor Olexy will present on blockchain for vaccine tracking at the “Appy Hour” (pun intended) on Monday, December 10, in the evening. Krista Baptista will participate on a panel discussing responsible data use on Monday, December 10 and will moderate “Digital Solutions and Medical Vendors: Improving Health Outcomes through Market-Based Approaches,” on Tuesday, December 11. Bobby Jefferson will moderate “Electronic Medical Records” and speak on the “Making the Business Case for Digital Health” panel on Tuesday, December 11. 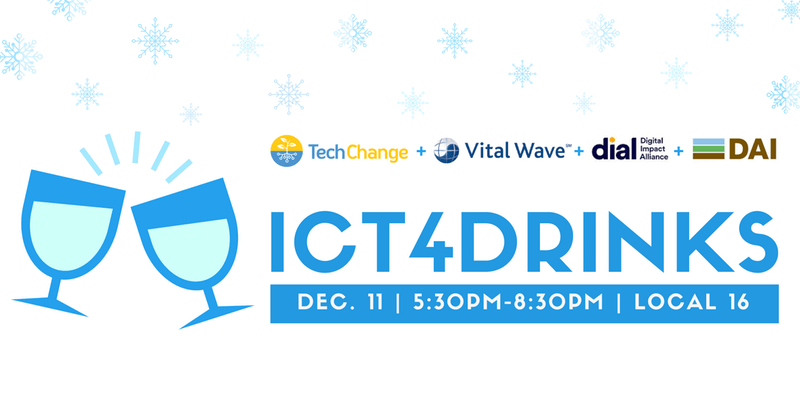 The Center for Digital Acceleration is also co-hosting an ICT4Drinks happy hour with TechChange, Vital Wave, and the Digital Impact Alliance. We’ll be at Local 16 on U Street from 5:30 to 8:30 p.m. on December 11. RSVP now! and join us to discuss big ideas on little napkins.